One thing is for sure, you cannot visit Bangkok without seeing a market. 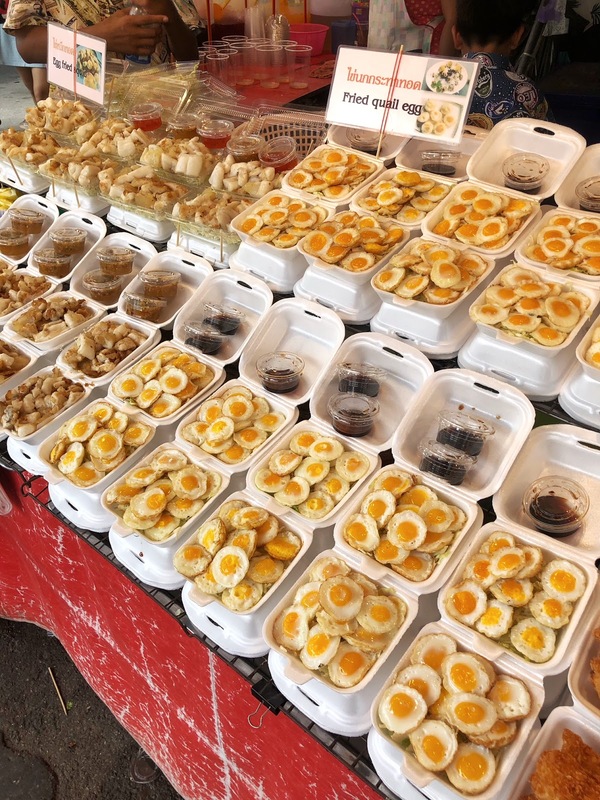 Street markets, night markets, floating markets, weekend markets....they are everywhere. During our two week trip, we visited more than 10 markets throughout the various locations we visited. 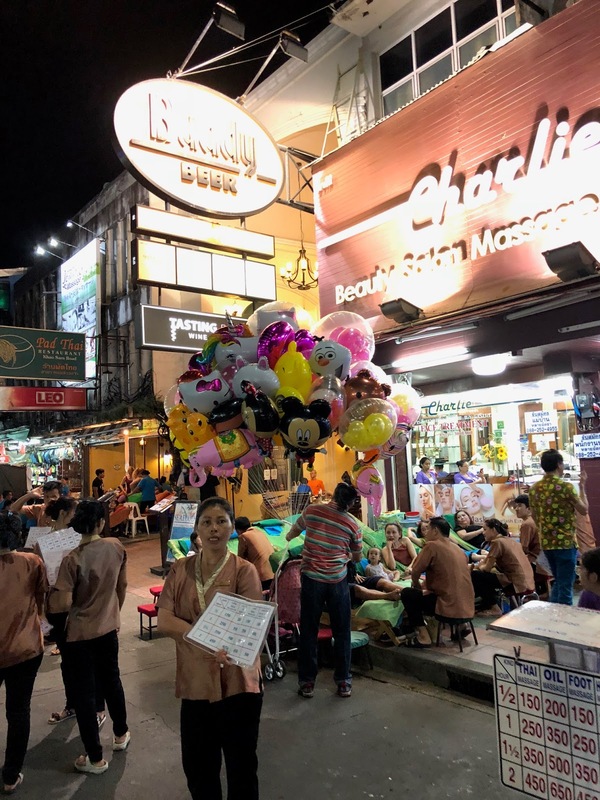 Here are a few we experienced in Bangkok and my honest thoughts about them. 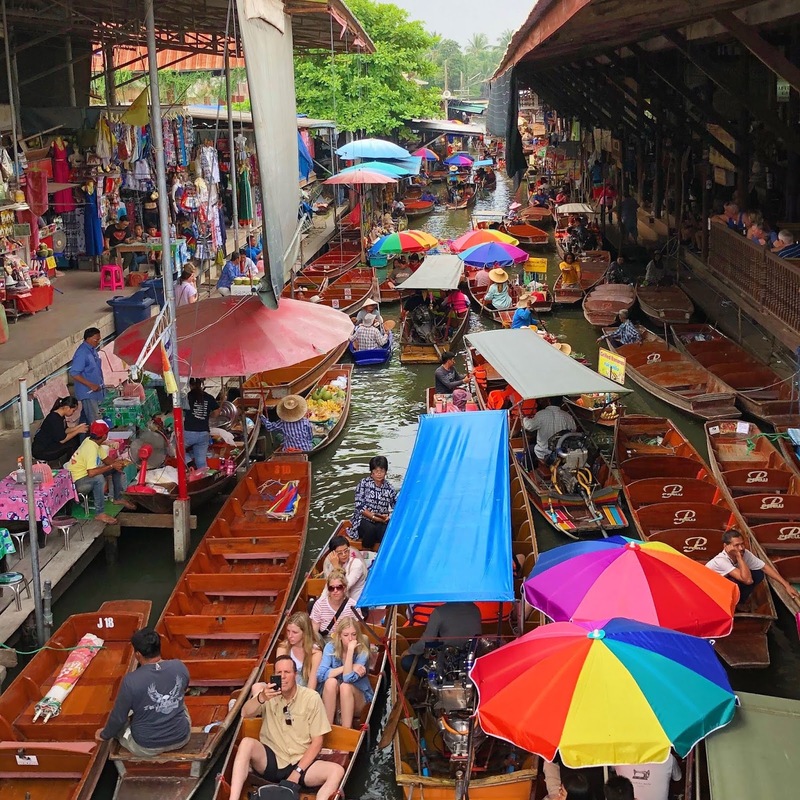 While in Bangkok, we booked a half day tour to visit the Damnoen Saduak Floating Market. 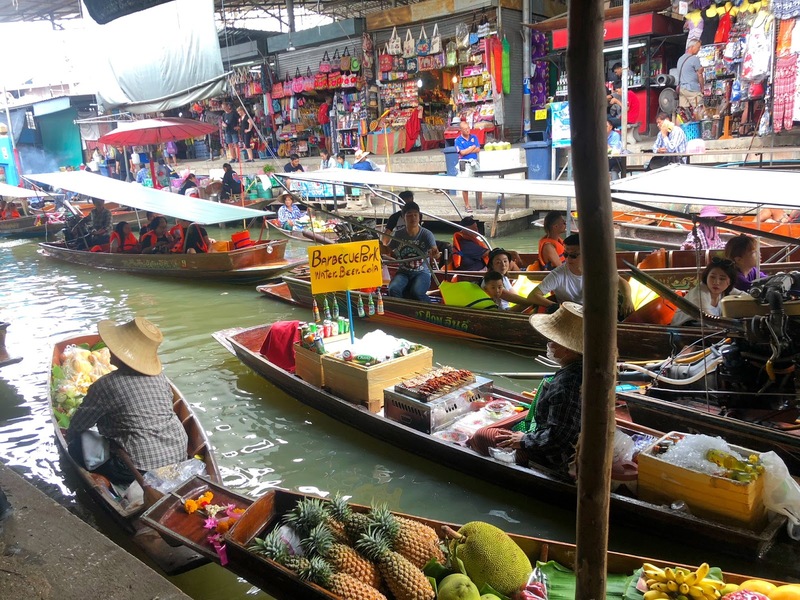 Visiting a floating market was on all of our "must see" lists. However, if I were to go back, I would absolutely find a different one to visit. Here is why: It's 100% tourist trap. Although there are many other blogs and websites suggesting to miss this and visit another, we were starry eyed over the variety of photos we saw online, making this what we thought was a must visit experience. 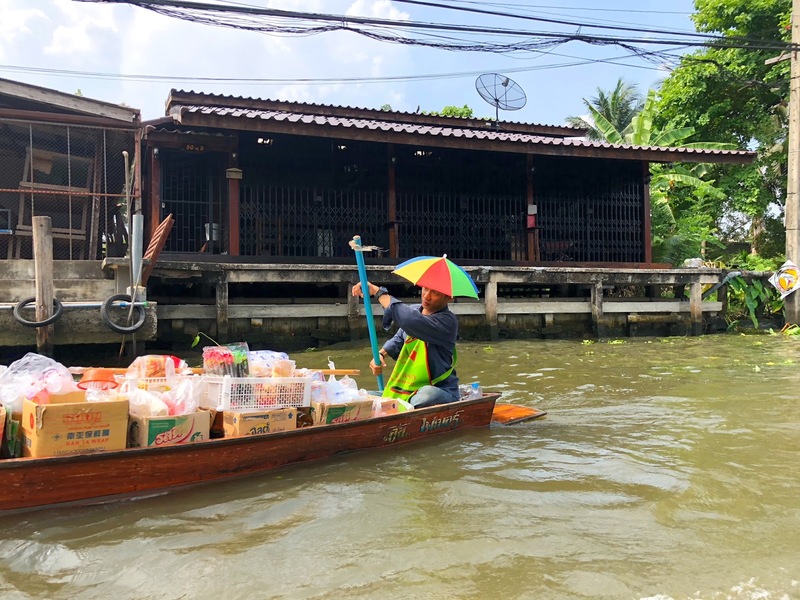 We visited the floating market the second day in Bangkok and we weren't prepared for the amount of bartering we would experience. We even had to barter buying beer. Sure it was cool seeing all the vendors on the side of the narrow canals and the food being served off of a boat. Yet it was a floating flea market. 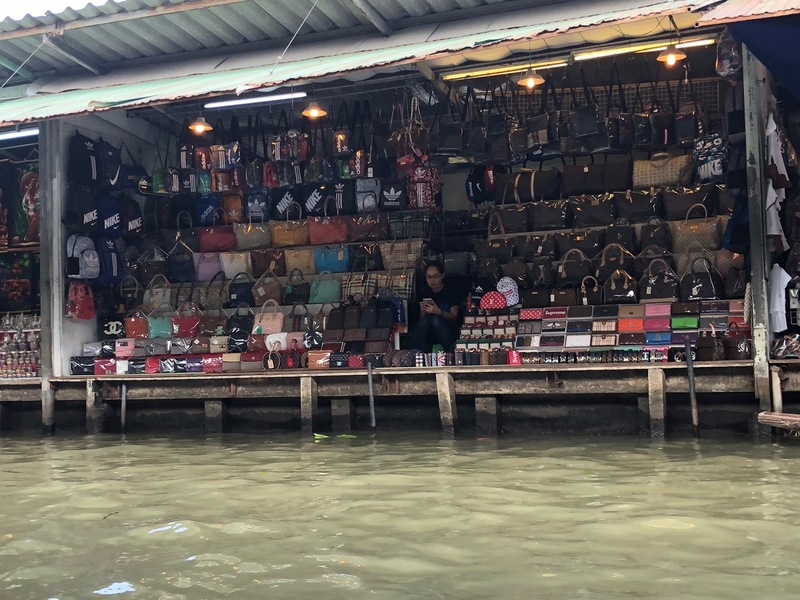 If floating in a boat, being haggled to buy Knock off designer bags or Thailand souvenirs are your thing, than you would like it. I expected more of an authentic experience, not an attraction - and didn't expect inflated pricing. Here's an example. Once we arrived and got on a boat (the boat isn't part of the tours and is an extra cost), we were instantly approached by a woman in a boat selling beverages. We decided to get a beer and she charged us each 200 baht. We didn't know any better. I did the math and realized we just spent $24 USD on 4 beers. The average price for 1 beer is 60 baht (about $1.80). We laughed it off, rookie mistake. Then another beverage person approached us and our driver talked to her in Thai, surely saying we just spent 200 baht a beer. We told her we would take 4 for 500, which is still pretty high considering... and she flipped out on us. It wasn't pleasant at all. We ended up agreeing on 4 for 600. When we got off the boat, we saw a bar/restaurant selling beer for 50 baht. We got hosed. Getting to the market was the best part, we went into a longtail boat and saw the local houses and way of living. That part made the tour worth it. 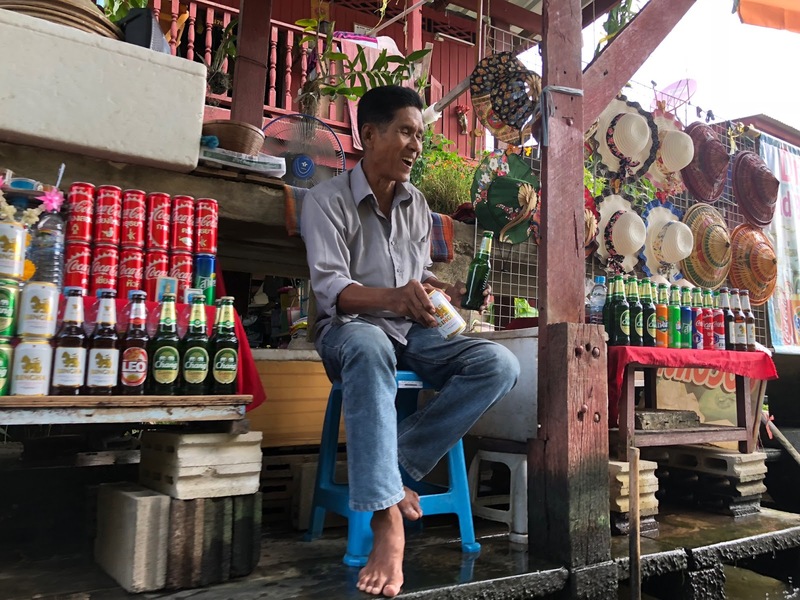 I was a unique experience seeing the floating market in action, and we got some really cool pics - but I would never go out of my way to do it again. I wish we would have listened to the other sites and visited a floating market with a bit more authenticity. Now this is what I'm talking about. I will never shop the same again! 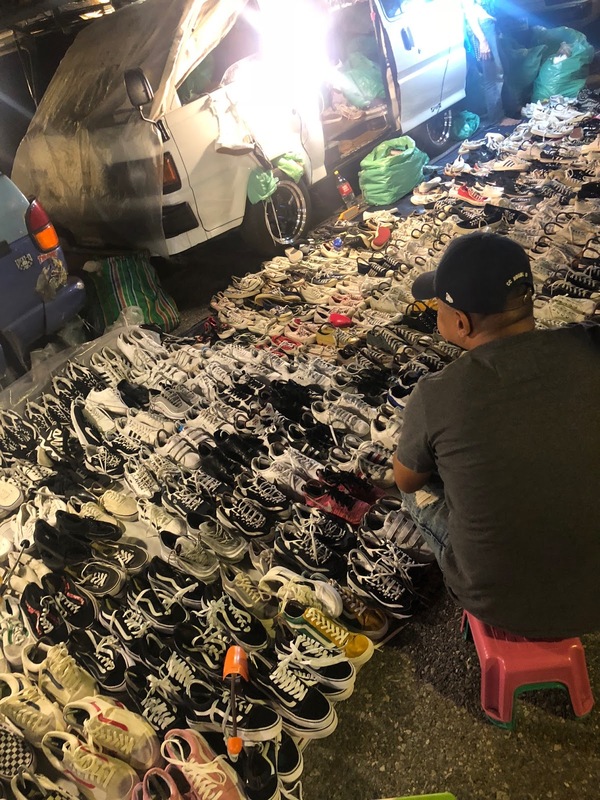 The Chatuchak Weekend Market has everything your heart desires at prices so low you feel bad to negotiate (but still do it!). We spent half a day exploring the weekend market but could have easily spent the entire day given the size. 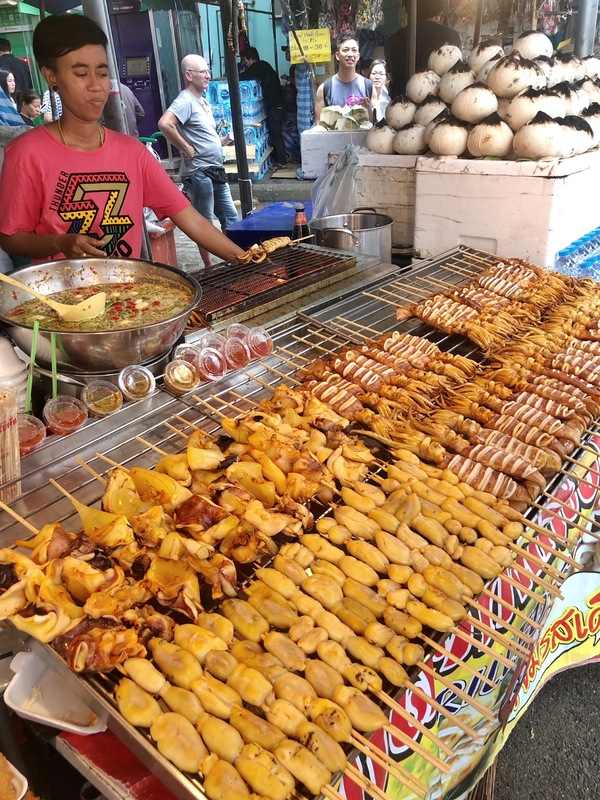 The Chatuchak Weekend Market is the largest weekend market in the world and the largest market in Thailand. It's massive. 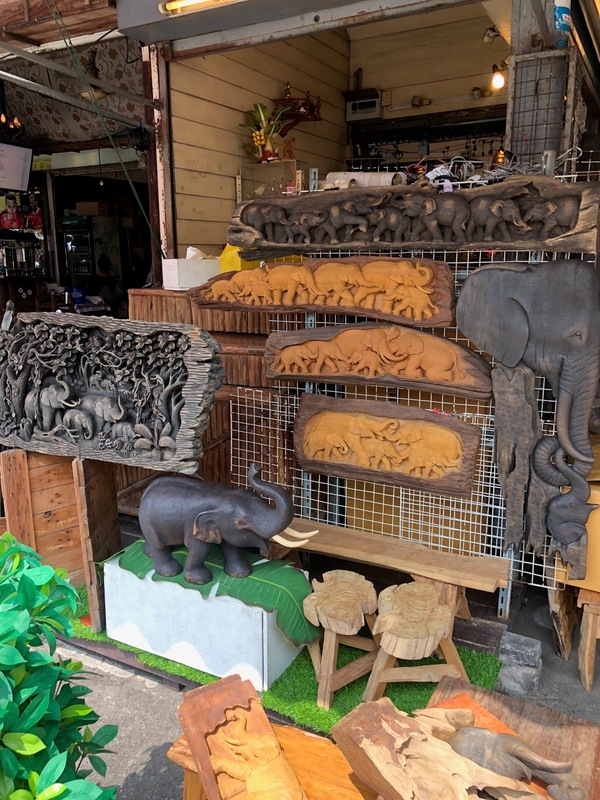 We purchased Thai silk, hand carved figurines, hand stitched silk wall art and bought a ton of street food. Being Bangkok was our first destination, I didn't want to lug around too much stuff early on, this was a mistake made by us as we ended up buying additional gifts at 10x the price at the airport. 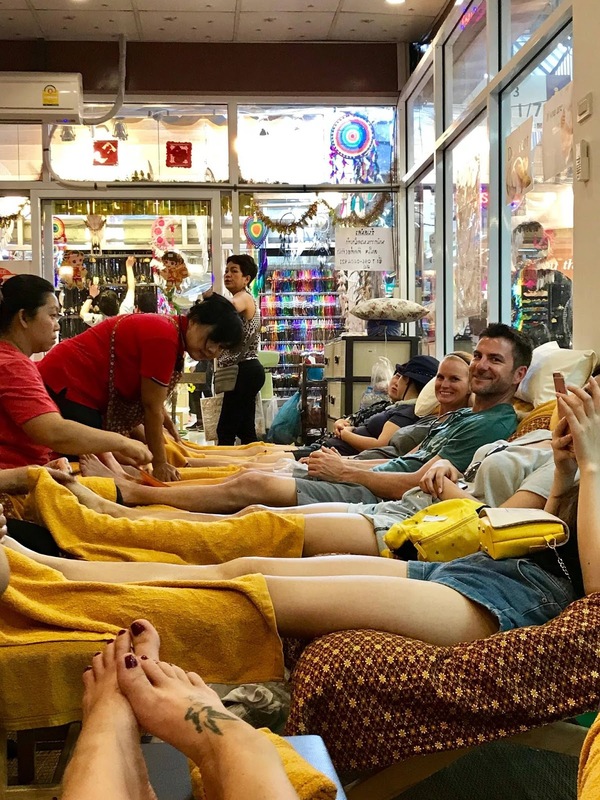 We got foot massages for 200 baht ($6 USD). 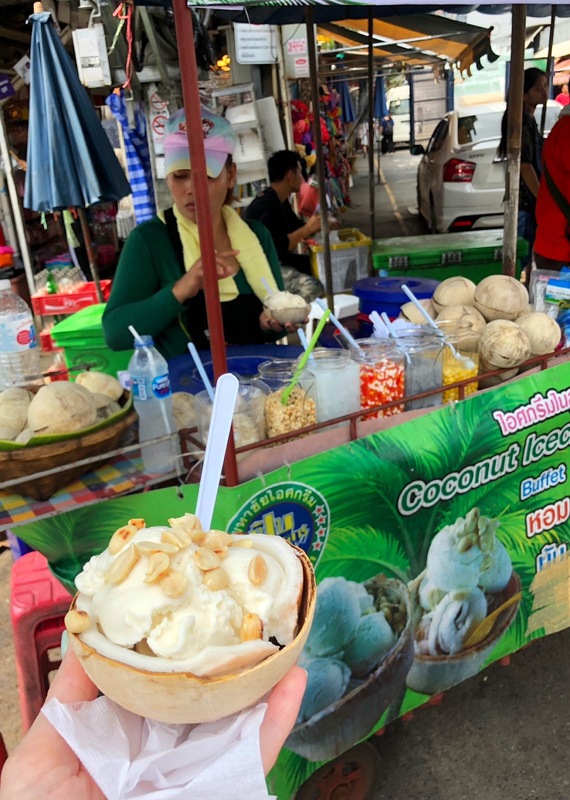 You must try the coconut ice cream (this coming from someone who insn't a coconut fan). It's delicious and will cool you down. Watermelon smoothies were my go-to in the heat. 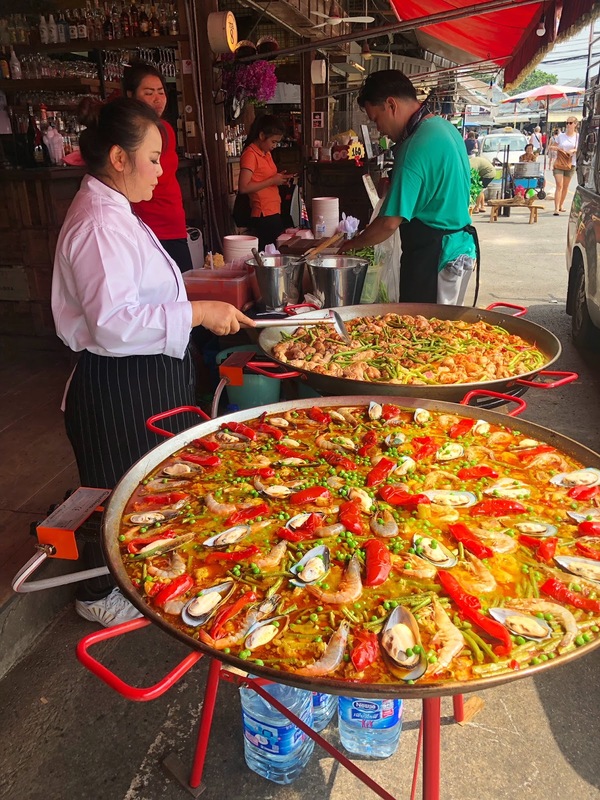 The food at the market is out of control and you can find whatever you want, including paella! 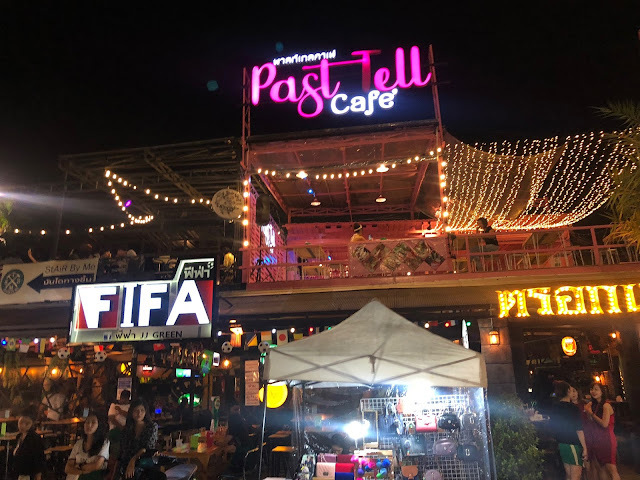 If you find yourself in Bangkok on a weekend, this is a must see experience. Right beside the Chatuchak Weekend Market is JJ Green night market. This is open 7 days a week and we decided to visit one night and grab dinner while there. I will say, it wasn't what we were expecting and I wish we would have spent the night over in China Town. JJ Green was cool and had a hipster feel to it, but it wasn't a must visit for me. 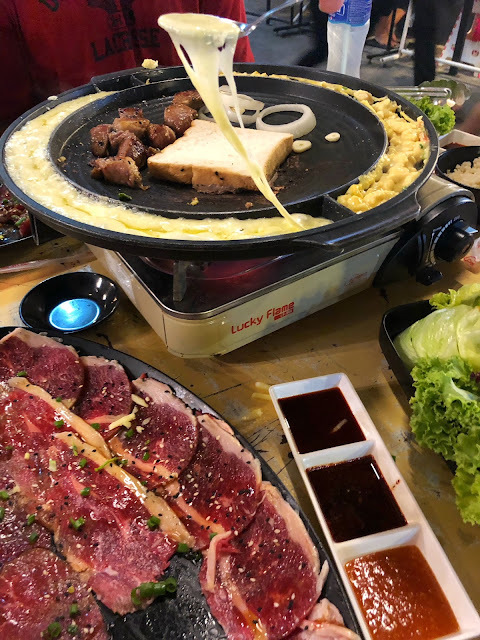 We ended up having dinner at a spot called Hachi Grill Dip Cheese, which was essentially fondue meats Korean BBQ. Very cool experience and made the trip over to JJ Green worth it. We also tried a few of the street food items. Regarding stuff to buy, this market was geared towards locals, which was really cool to see. Tons of apparel and shoes - shoes - shoes. What's with the shoes!? JJ Green also had quite a few bars, but all were empty. We did visit at the beginning of their low season which I did prefer. If you want to do a night market, I would suggest visiting China Town over JJ Green. 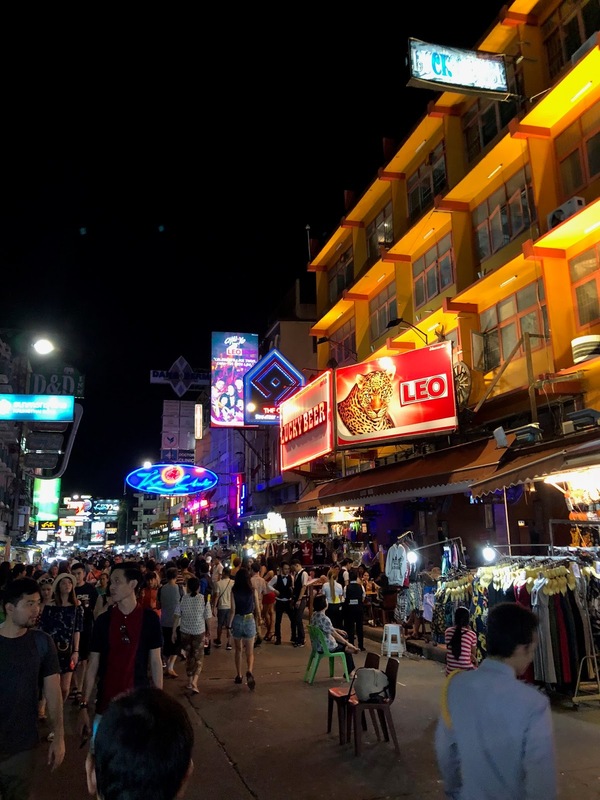 I am not sure if you can even call Khaosan Road a "street market", but I am - it's a long street that resembles Bourbon Street with vendors everywhere you look, once again selling knockoffs and food. This is where you can eat bugs. They had everything from tarantulas to centipedes. However, no photos without paying. Yuck. We ventured down the road, beer in hand and stared at the scene in front of us. People approached us every 5 seconds, asking the guys if they wanted to buy a custom suit, pushing signs in front of us for laughing gas. It was a very bizarre experience. Worth seeing if you're in the area but we didn't venture into the bars or truly experience Khaosan Road other than walking down the street. Weekend Market: YES YES YES! 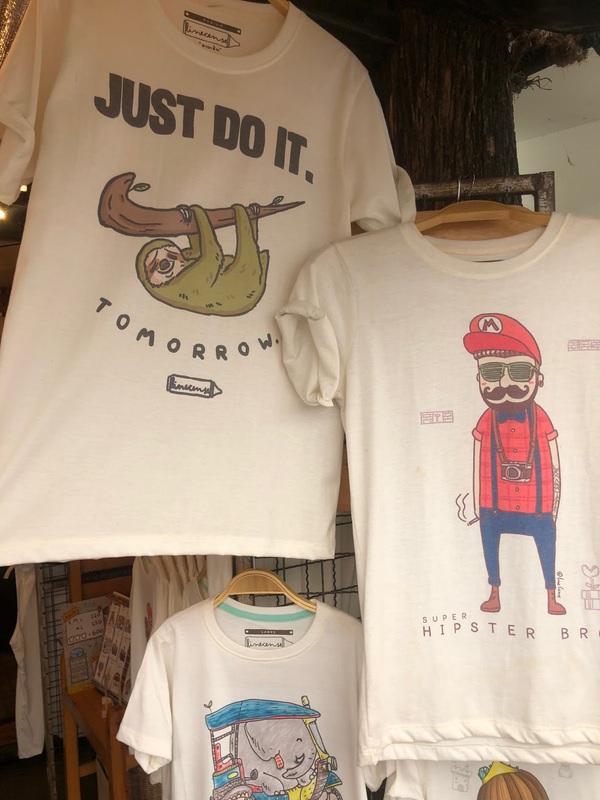 I 100% suggest visiting Chatuchak Weekend Market. Go early, beat the crowd and the heat. Bring a bag to carry your purchases and if you see something you really want, buy it! 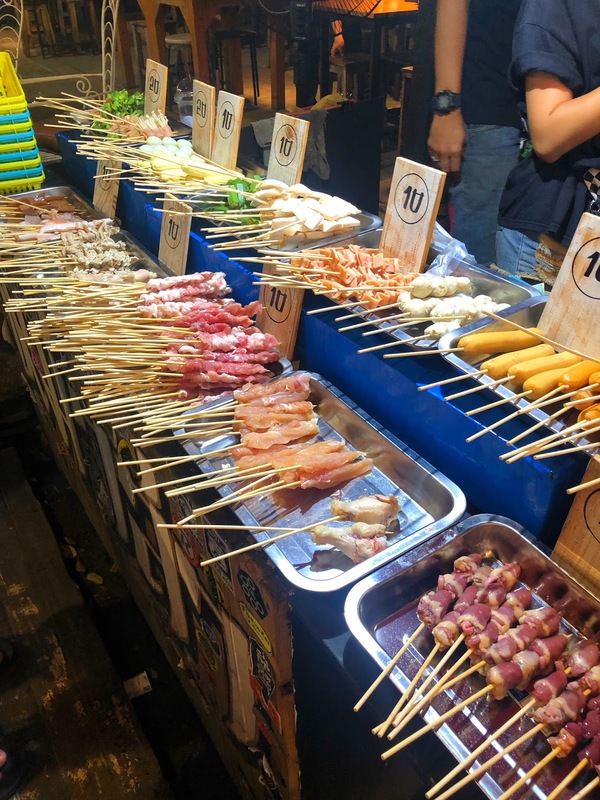 Night Market: We did so many markets, I could have easily done without the night market and spent that night exploring other parts of Bangkok. I would plan on visiting two markets and deciding which is most important.